Austin, TX, February 13, 2018 – System Surveyor, the company offering an award-winning mobile and graphical system design and management tool, announced the release of version 4.5 of the software as a service tool. 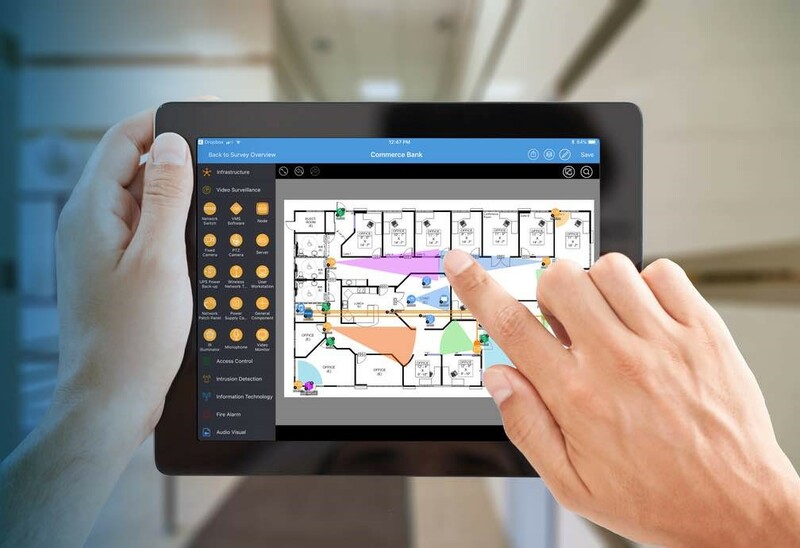 The new release delivers the easiest-to-use, most powerful system design and life cycle management tool on the market for integrators and system managers alike. The updated version is available immediately to all System Surveyor users. New menu and workflow, site-level reporting for multiple surveys, updated and consolidated PDF formats, and search filter criteria. It also includes a new Critical Date Report for all elements within a specified date range for installation, warranty, service, inspection or end-of-life dates. Provides user/timestamp capture of activity for each Element for Pro and Team Users. Allows Team Administrator to preconfigure element profiles to be used by all Team Members, including pre-assembly of “containers” such as Nodes or Doors. Calculates a budget estimate for each element applied to a survey based upon Element Profile pricing and labor units providing a Budget Estimation Range for entire survey. “This is the tipping point for integrators to move into digital system design and management. These new mainstream features enable any size integrator to be more competitive by engaging their customers like never before. The new capabilities help integrators visually estimate and budget for projects with their prospects which speeds the velocity of sales and improves staff efficiency. System Surveyor’s compelling ROI just got even higher.” said Christopher Hugman, P.E., CEO of System Surveyor. Visit the blog post for a comprehensive list of V4.5 features. System Surveyor users can visit the AppStore to upgrade the app on the Apple iPad®. System Surveyor is exhibiting at PSA TEC 2018 in Denver on March 12-16 in booth #F404 and at ISC West in Las Vegas on April 11-13 in booth #31092. System Surveyor is an award-winning software as a service solution which simplifies system design, installation and lifecycle maintenance. Supported system types include Video Surveillance, Intrusion Detection, Access Control, Fire-Alarm, Information Technology, Audio-Visual and Cable Infrastructure. The result is improved quality and accuracy of system design, faster implementations, better system reliability, lower total cost of ownership (TCO), and reduced project risk. The tool works as an iPad-based App or on any device with a networked Web browser. Basic subscription is free and Professional and Team subscriptions are available for enhanced functionality. System Surveyor is based in Austin, Texas and can be found at http://www.SystemSurveyor.com.